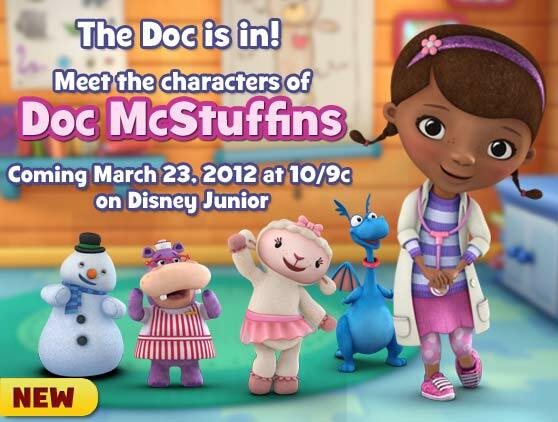 Doc McStuffins is a brand new CGI animated series which is premiering on Disney Channel this coming March 23rd as part of their Disney Junior programming. The show was created by Emmy-Award-winning writer and producer Chris Nee (who also wrote for The Wonder Pets) and it’s directed by Emmy-winner Norton Virgien (Rugrats). 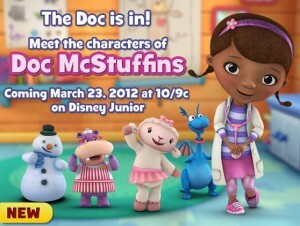 The show follows the adventures of a 6-year-old girl who discovers that, using her magic play stethoscope, she can talk to toys… and so, she sets up shop fixing them when they’re having troubles. The show is produced by Brown Bag Films out of Dublin, Ireland, with some animation from Sparky Animation in Singapore. TV Guide on line has some background information on the show and a preview video too. Update (29 Feb): The initial revision of this article incorrectly implied that Chris Nee was the creator of The Wonder Pets, and cited Sparky Animation as co-producers of Doc McStuffins.